The man who created history was afterall a small man, just 5ft 4in tall, of slight build and with a weak constitution. He was frequently very ill with recurrent bouts of malaria and dysentery, relics of his time in the tropics, Madras, Calcutta and Ceylon. It is read that he sailed for East Indies and arrived at the British outpost at Madras on 25 May 1774. With the outbreak of the First Anglo-Maratha War, the British fleet operated in support of the East India Company and in early 1775 Seahorse was dispatched to carry a cargo of the company's money to Bombay. In early 1776 Nelson contracted malaria and became seriously ill. He was discharged from the vessel Seahorse on 14 March and returned to England aboard HMS Dolphin. In 1780 he was again very ill, this time with scurvy and his life, and the lives of his shipboard companions, hung in the balance. But once again this small, apparently frail man survived! The famous battle of Trafalgar (1805) was a naval engagement fought by the British Royal Navy against the combined fleets of the French and Spanish Navies, during the War of the Third Coalition of the Napoleonic Wars(1796–1815). 27 British ships of the line led by Admiral Lord Nelson aboard HMS Victory defeated thirty-three French and Spanish ships of the line under the French Admiral Villeneuve in the Atlantic Ocean off the southwest coast of Spain, just west of Cape Trafalgar, near the town of Los Caños de Meca. The Franco-Spanish fleet lost twenty-two ships, without a single British vessel being lost. It was the most decisive naval battle of the war, conclusively ending French plans to invade England. 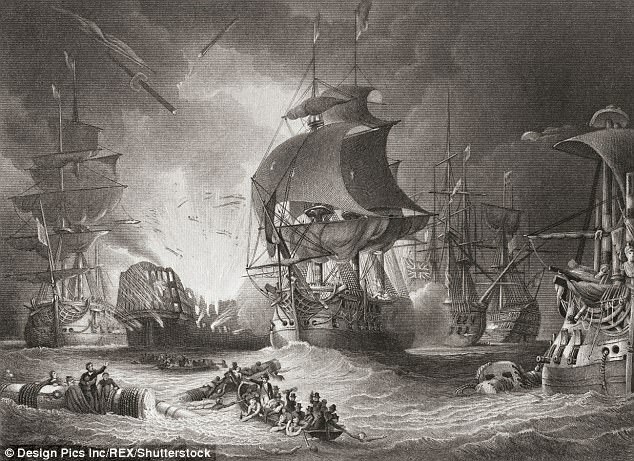 The British victory spectacularly confirmed the naval supremacy that Britain had established during the eighteenth century and was achieved in part through Nelson's departure from the prevailing naval tactical orthodoxy. During the battle, Nelson was shot by a French musketeer; he died shortly thereafter, becoming one of Britain's greatest war heroes. In between, we know ‘ Nelson ’ ~ for a different reason and meaning altogether – more of a Cricket slang and superstition !! - in the game, the reference is to scores of 111 or multiples thereof. Often the reference 111 meant that Nelson was one eyed ! ~ it was feared that bad things would occur at this score, batsmen would get out !! David Shepherd made popular the longstanding practice of raising a leg from the ground on Nelson in an effort to avoid ill fate. Whenever the teams or individual score is 111 or multiple (222, 333, 444, 555) crowds would cheer seeing the raised leg of David Shepherd. No post on Cricket, more on the famous sailor hero. Vice Admiral Horatio Nelson, 1st Viscount Nelson, 1st Duke of Bronté KB (1758 – 1805) was a British flag officer in the Royal Navy. Known for his inspirational leadership, superb grasp of strategy, and unconventional tactics, which together resulted in a number of decisive naval victories, particularly during the Napoleonic Wars, he is hailed as hero of UK. He was wounded several times in combat, losing the sight in one eye in Corsica and most of one arm in the unsuccessful attempt to conquer Santa Cruz de Tenerife. He was shot and killed during his final victory at the Battle of Trafalgar near the Port City of Cadiz in 1805. He was particularly active during French Revolutionary Wars in the Mediterranean. In 1797, he distinguished himself while in command of HMS Captain at the Battle of Cape St Vincent. Shortly after the battle, Nelson took part in the Battle of Santa Cruz de Tenerife, where his attack was defeated and he was badly wounded, losing his right arm, and was forced to return to England to recuperate. The following year, he won a decisive victory over the French at the Battle of the Nile and remained in the Mediterranean to support the Kingdom of Naples against a French invasion. In routing the French fleet during the Battle of the Nile, as it became known, he was protecting British interests, threatened by Napoleon Bonaparte’s invasion of Egypt which lay on the trade routes to India. Having earned the gratitude of the Sultan of the Ottomon Empire, Horatio Nelson was given the Ottoman Empire's highest military decoration. Sultan of the Ottoman Empire bestowed on Nelson the Chelengk, the Ottoman Empire’s highest military decoration. 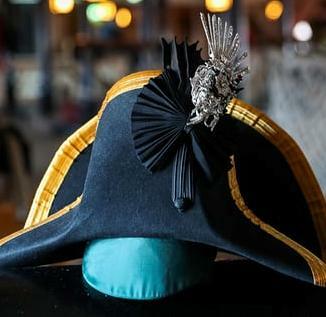 Traditionally pinned to a turban, but attached by Nelson to the cockade of his hat, it would become one of the most famous, and yet ill-fated, jewels in British history. The 1st Test in 2011 Series between Australia and South Africa was played at Capetown. Put in, Aussies made 284 and dismissed hosts South Africa for 96 runs. In the 2nd essay, Australia were reduced to 13–3 by tea ; 21–6 to 21–9, before being bowled out for 47 runs. Debutant Vernon Philander finished with figures of 5–15 from seven overs. Then Graeme Smith and Hashim Amla both scored centuries to ease SA to 8-wicket victory. On the final day of the test, being 11 November 2011, with the time at 11:11 with South Africa requiring 111 runs to win, the majority of the crowd and umpire Ian Gould did Shepherd's leg raise Nelson for that minute with the scoreboard reading 11:11 11/11/11. A glittering mass of more than 300 white diamonds, it was the size of a child’s hand but with 13 fingers, one for each of the French ships taken during the action; its centrepiece was a rotating clockwork star which threw candlelight around a room. However, it reportedly brought misery to Nelson and to every other person who later possessed it. It was to be stolen shortly after World War II from the National Maritime Museum in Greenwich. London jewellers Symbolic & Chase have financed a replica which has just gone on show at the Portsmouth Historic Dockyard, and will be exhibited in London this week. Made with real diamonds, and its own clockwork mechanism, it’s a faithful reproduction of an object which seems to have brought ill-fortune to just about everybody who came into possession of it. Valued at £250,000, the replica will be auctioned in London next year, with some proceeds going to fund the conservation of HMS Victory.